This eerie new astronomy picture looks like the Eye of Sauron in the film The Lord of the Rings. In the film, the Eye of Sauron marks the final destination of the character Frodo's long journey. But the object shown in this picture doesn't mark the end-point of a journey across space - it's just one of many distance signposts that are dotted across the Universe! 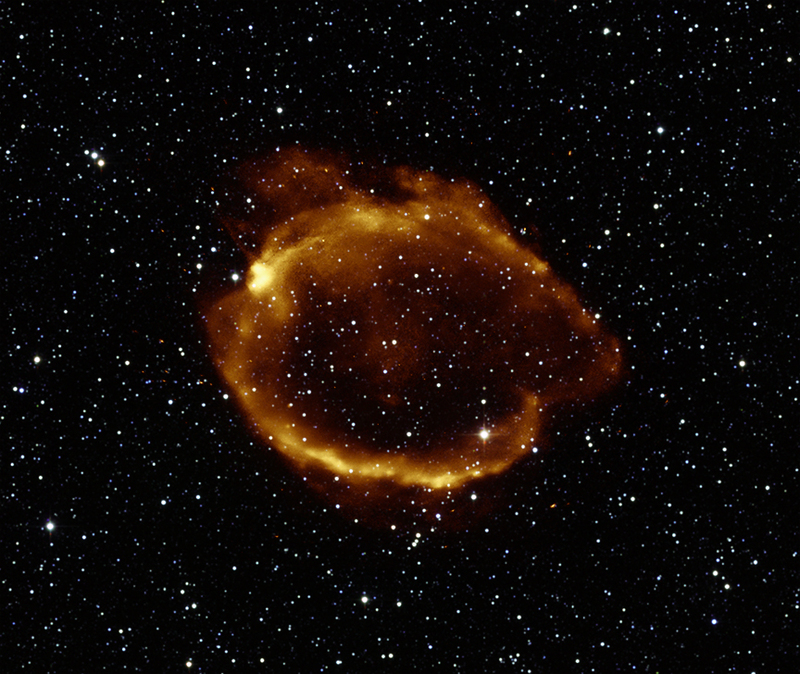 The photograph shows the remains of a star (named G299.2-2.9, shown above) that has exploded in what astronomers call a supernova explosion. There are different types of supernova explosions. The kind that created the remains shown here is called a 'Type 1a Supernova'. Such supernova explosions are useful to astronomers, as they allow them to work out distances in the Universe. Obviously, astronomers can't measure the distance to objects in deep space by using a ruler. However, every Type 1a Supernova has the same brightness when the star explodes. This means that astronomers can work out how far away they are by how bright they look when viewed from Earth: The fainter the explosion, the further away it must be. With Type 1a Supernova explosions being spotted in various places across the Universe, astronomers can use them to estimate the distance to other, nearby objects. So, these supernova explosions act like glow-in-the-dark distance markers in space! Cool fact: A single star that explodes as a Type 1a Supernova can give off as much light as an entire galaxy that contains hundreds of billions of stars! Do you want to learn more about this topic?